It’s become a bit of a tradition on Friday’s. 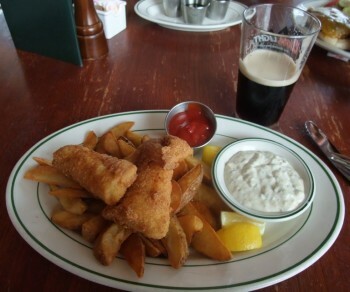 We go to the Irish Pub right around the corner from work and get a Guiness, Fish and Chips. 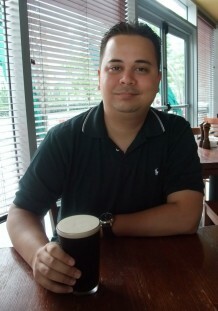 We typically go with one of the British guys in the group and its a down right weekly taste of the UK! It is actually cooked really well, and my only complaint is how I feel after eating a big tub of tartar sauce, which is really just flavored mayonnaise. I might have to cut down on that this week. I actually saw a a movie during its opening weekend, which I haven’t done since Zodiac, and even then I didn’t realize it was the opening weekend (Otherwise I would not gave gone!) Wall-E was excellent. I especially liked that they were able to build the characters with almost no dialog. I went late on Sunday night, so the number of kids were at a minimum. Which means everyone else there were the type to cheer at the Mac-startup sound when the robot finished charging for the day. I’m not sure if it’s just New York, or if the number of computer geeks are increasing day by day. So I’ve been counting the calories, and I think I have a sustainable diet plan. I’ve been doing this on and off for the past couple months, but I think I might be able to maintain it now. ?? – As much Green Tea as I want. I don’t think this has any calories, but tell me if I’m wrong! I’ve done that for the past couple days, but now that I add it up, I’m worried it might be too low. Only adds up to 1276 calories, and that’s if I finish the crackers, which I usually don’t. Hmm, maybe I need a snack in there somewhere. At least it gives me some room in case I want to get a variation on the sandwich or soup some days. Anyway, this is the plan, and I used to “take a break” on the weekends, but I think I might stop that. My only break will be the Friday Fish and Chips. I’ll give it a month and see if I get any results. Seems like this is also Vegetarian, Vegan even. I might be turning into a hippie! On days I exercise, I have these organic fruit/granola bars. These are the only ones I could find without corn sweetner in it. Read Omnivore’s Dilemma! I may have written about that book before, but I can’t recommend it enough. For some reason, I was really suspicious while reading the book, and kept looking for the point where he might use some left-wing vegetarian hippie logic for something. He goes from being a vegetarian to shooting his dinner, and has good things to say about both. He was constantly giving good opinions on all points of the spectrum, so I didn’t label him. I guess that’s the mark of some unbiased research. In the end, its the Christian Libertarian farmer that’s the hero!